Choose the scaling option for Toes-to-Bars that allows you to maintain a good rhythm. The Thrusters should be medium-heavy and unbroken. Warm up and perform one heavy set of 15, then of 9, then of 3, increasing load on each set. Editor’s note: It’s the beginning of a new training cycle. Time to take stock and set goals! For many of us, that will involve the all-important Pull-Up. So today we’re bringing you a blog classic, “Developing Your Pull-Up.” This updated version was originally posed on 9.12.17. Enjoy! There are a bunch of reasons to get better at doing Pull-Ups. For one, we do a bunch of them in CrossFit. They’re also a great way to increase the strength of your upper back, arms, lats, grip, and help to have a balanced and healthy shoulder girdle. You should be able to do strict Pull-Ups with a variety of grips, and once you can consistently do few Pull-Ups at a time it may be time to start working on the Kipping Pull-Up. Here’s how you’re going to get better, no matter where you are in the process. Ring Rows or Band-Assisted Pull-Ups. Use an angle or band that makes completing all the repetitions challenging. Rest as needed between sets. Choose a weight that feels like you could have done another rep or two at the end of the set. Take minimal rest between exercises in the superset. Using a box that allows you to stand and reach your a few inches north of your elbow to the bar, jump up and hold 2 second pause with chin over bar, then lower for 4 seconds down, using either a Pull-Up or a Chin-Up grip. A good way to structure these is do do the 2 reps every minute on the minute for 10 minutes. Yes, that seems like a lot of rest in between reps, and no, it’s not a lot of total reps. That’s a good thing, trust me. Week 1: 6 sets of 2 reps. Rest 1 minute between sets. Perform twice a week. Week 2: 5 sets of 3 reps. Rest 1 minute between sets. Perform twice a week. Week 3: 4 sets of 4 reps. Rest 90-120 seconds between sets. Perform twice a week. Week 4: 3 sets to failure. Rest 3 minutes between sets. Perform twice a week. This program can be used until you have a set of 10 reps in the 4th week. If you don’t get the 10 reps in Week 4, restart at Week 1 and add a rep to each set. Week 1 would be 6 x 3, Week 2 would be 5 x 4, and Week 3 would be 4 x 5, then retest in Week 4. End each session by practicing Kipping Pulls-Ups for a few small sets, no more than 5 sets and no more than 8 reps. Terminate the set if you fall out of rhythm. It’s all about developing a rhythm that you can control and maintain. Remember that a solid Kip uses your whole body and don’t forget that your abs need to be engaged throughout. If you fly open in the front of the Kip, you are leaking tons of energy away from the bar. Check out this video for a peek at what an efficient Pull-Up should look like. 1) Once a week do a set or two to near failure. Start with a Pull-Up grip (hands outside shoulder width and palms away) and when you are 2 reps shy of failure switch to a Chin-Up grip (hands inside shoulder width and palms toward you). When you are 2 reps shy of failure switch to a mixed grip (1 palm in, 1 palm out) and do the same before switching again. 2) You can practice similarly by doing a set or two of max strict Pull-Ups, immediately switching to Kipping and again going till failure (or a rep shy of it). 3) Start doing weighted Pull-Ups/Chin-Ups, 3 sets of 5 reps, and seeing if you can add weight each week. 4) 30 seconds on/30 seconds off for 5 minutes of max reps kipping pull ups. The set ends if you come off the bar. Remember to stay engaged in the trunk. Don’t leak energy out in front. Remember this video. 5) Each time you’re in the gym do a 3-5 sub-max sets of Kipping Pull-Ups, trying to add a rep each time you do the drill. You want to feel fresh and stay shy of failure here. Terminate the set if grip becomes the limiting factor. Again, remember to stay engaged and not leak energy out of the front of the Kip. 6) If you have a solid Kip that just seems to go away on you when you get gassed, then try practicing your Pull-Ups under duress. Do 50 Double-Unders or sprint down the block and back followed immediately by a set of 10-15 Pull-Ups. EMOMs also work really well here. If one of the days that you’re in the gym involves a lot of Pull-Ups, then consider that a replacement day for one of the days on the above programs. Also consider this: it’s no mistake that smaller, lighter people have an easier time with Pull-Ups. 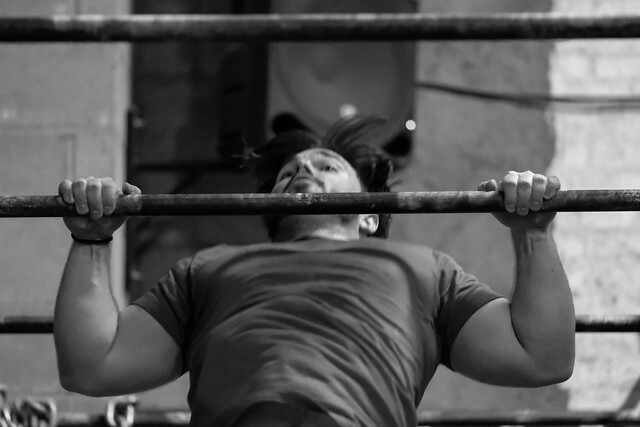 While the barbell exercises can be scaled easily to ability, calisthenics cannot. If you have some weight to lose, then a solid nutritional program can work in tandem with the above programs to help you achieve the pull up. Check out the folks over at Whole 9 or our buddy Robb Wolf for lots of info from simple tips to detailed programs to get you started. Three cheers to getting yer Pull-Ups up! I will vouch for pullups being much easier when you weigh less! Last night I did AG pullup class, my first time trying kips since the wrist issue emerged. Good to know I still have them, and that I was able to get through the class with only minimal feedback from my wrist. But I definitely noticed a difference in my ability to get over the bar now that I weigh almost 10# less (thanks Precision Nutrition!). 185 was easy today. Hm. Good reminder that even if you have some strict, you can always get stronger and do more. Woohoo, pull-ups! In my own experience, going from some strict pull-ups to CTB pull-ups with strength through the full ROM also included some dedicated scapular work. Those end ranges can be tricky! 10am group class with Brett and a great crew! -TTB were pretty chill for sets 1-2, a bit harder in last few reps in set 3-5. -would be a very different beast without that extra rest minute. ugh. I’m just weak off the floor — first rep is so painfully slow, after that it’s fine. did some extra lifting to take a step in the direction of improving that! -i loved/hated this variation and am going to repeat it. need a break from RFESS and I think it will translate well. I probably should’ve gone heavier, but that’s the most I’ve done in a while so left it there. Thanks for this, Fox. Not only for the programming ideas for those of us who are trying to build to a strict pull up, but also for the encouraging reminder to those of us who are not smaller or lighter (au contraire!) that we can work on two goals at once!